Remembering Mitch Stein, HHS ’73. Like most kids in high school, and college, I had a couple of spheres of pals, which often overlapped, and Tom and Mitch were part of a coterie that included Mike Bifulco, Scott Savitt, Ricky Rosenthal, Seth Josephson, Andy Stone, Bobby Pileggi and several others whose names I just can’t summon at this moment. Today, I have only limited contact, via Facebook, with most buddies from the old days, so it was a shocker when Scott posted the news that Mitch, 61, had passed away, felled by cancer. Over the years, at nostalgic moments, perhaps when looking at faded photos, I’ve thought about those guys, and though memories are selective, with most day-to-day interactions lost to a sort of mind decay that comes with advancing age, I’ve no problem picturing the image of Mitch, his shoulder-length hair framing a tall, thin body, his common hippie uniform of jeans, work boots, and light-blue work shirts, and the loads of fun we all had hanging out. Ricky told me on Monday that in his mind Mitch physically resembled the great actor John Cazale, especially from Dog Day Afternoon. Although I’d lost track of Mitch after high school, Scott, who roomed with him at SUNY New Paltz, filled in some blanks. Turns out that Mitch was a fast-lane guy in young adulthood (and really, who wasn’t? )—embracing the glam scene at the time, trading his long hair for a shag, wearing platform shoes, high-waisted pants, and heavily into the music of Bowie, Lou Reed, The Tubes, and Mott the Hoople. As Scott told me, Mitch didn’t have a band, but “sure looked like he did!” Then came the rest of the story, which I was delighted to hear. 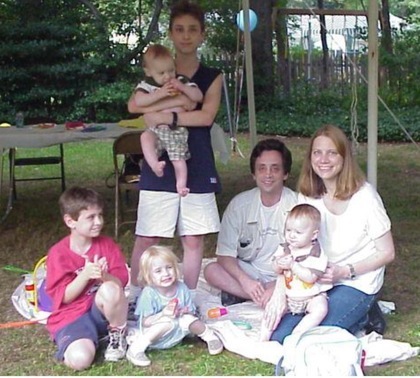 A sharp and modest guy, with a sardonic wit that could make your toes tingle, Mitch became an attorney, married, was the father of five children and led a productive and happy life on Long Island (photo below). That he’s now gone, at 61, with a large family deprived of so many years of his presence, is, of course, awful news to hear. True, he wasn’t snuffed out by a car crash or some freak accident—everyone knows a few outliers whose number came up cruelly early—but 61 isn’t 81 and it brings you up short. The picture above is from May of 1972, with Mitch on the left, next to Bobby at a blues concert at Huntington’s Heckscher Park—a frequent destination not only for music, but drinking beer and the like—and I believe it was a show headlined by the late Tom Pomposello (who also died young), a recording partner of Mississippi Fred McDowell, on a gorgeous spring night when you could actually see the stars. Tom, along with Rob Witter, had opened Kropotkin Records—I’ve written about this New York Ave. mecca on several occasions—in 1970 and for a lot of us, including Mitch, it was at times a clubhouse. I specifically remember, with step-by-step clarity, one Saturday in the winter of ’72, the streets compromised by the remnants of a storm, crusty yellow snow on the sidewalks, when Mitch, Seth and I took our temporary leave from Kropotkin’s and furtively found an undisturbed alley a few blocks away, and passed a small wooden pipe around, filled and tamped with a quantity of weed that came from a nickel bag I’d purchased from a smalltime “drug dealer” friend the night before. Even in suburban Huntington, getting stoned outside wasn’t a casual activity: local cop cars whizzed by, and the possibility of a bust by the fuzz wasn’t so remote, or so we thought, heightened by that first sweet buzz that was accompanied by paranoia until we were safely back on the street, making a stop at a deli before getting back to the record store.